-----My name is Teddy, or at least that's what my friends call me. 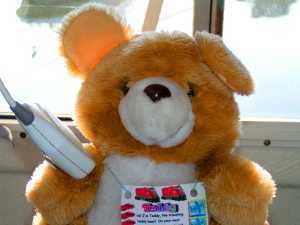 (My real name is Theodore Alyosious Bear, but I don't ever use that name). 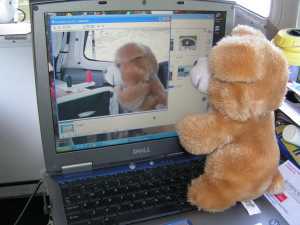 I am a traveling teddy bear, and my home is in Mrs. Rolfing's classroom in Rochester, MN. 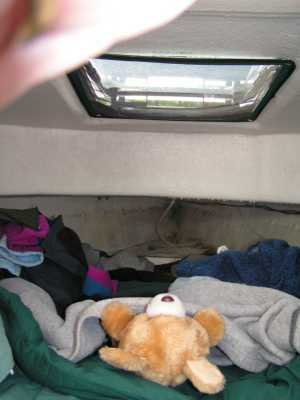 -----In April, 2005, I was sent by friends who live in the San Juan Islands of the State of Washington to their friends who were traveling in the State of Tennessee. 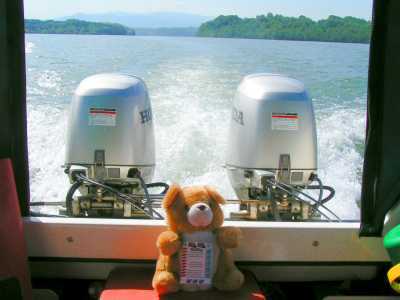 They live a different kind of life -- they live on a boat! ----You learn something new every day, or so Mrs. Rolfing says. Well, just like her students, I've been learning LOTS more than just one thing every day. 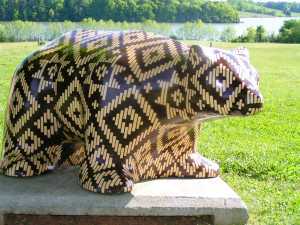 For instance, I learned, on my first day here in Tennessee, that some folks are nomads. Well, maybe I'm a nomad, too, with all my traveling, but I DO have a home back in the classroom. Some folks have no house, or at least not like you might think a house should be. Anyway, these folks I am with have not lived in a house for almost twenty years. They used to be teachers. Maybe that's what makes them a little different (no offense, Mr. Rolfing). These folks live on a BOAT! 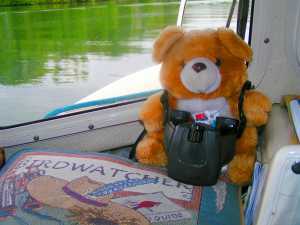 -----So, when I came to travel with them I discovered that they ONLY travel and that their travel is on a boat! Now, it's not a very big boat. It is only twenty-two feet long. Not much longer than some of the cars your parents own. But, they have everything on their boat. They have a kitchen, where they cook. A bed where they sleep. 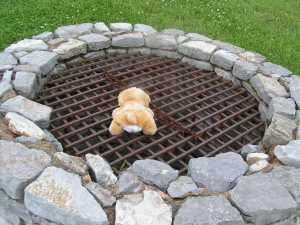 A nice heater. A shower with water heated by the sun. And a toilet. Almost everything your house has-- they just don't have much space -- and their 'house' floats. ----------The first thing I had to do was find out where I was and where I would be going. 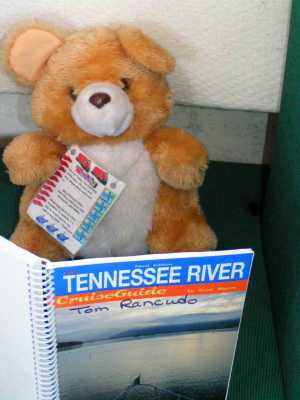 Fortunately, they had a Cruising Guide of the Tennessee River so I could find our route. It took a lot of reading in the guide, since it talked about anchorages and locks -- it took even longer for me because I didn't know what an anchorage was and the only lock I had heard about was for my friend's bike. -----Tennessee is in the southeastern United States. The eastern side of the state is wrinkled by the Appalachian Mountains. Here in Tennessee, folks call the mountains The Great Smoky Mountains, and they are a national park. 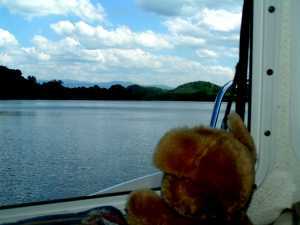 The Tennessee River begins in those mountains and flows westerly and northerly into the Ohio River and then into the Mississippi River. My part of this journey was to travel up the river with my new friends, El and Bill. 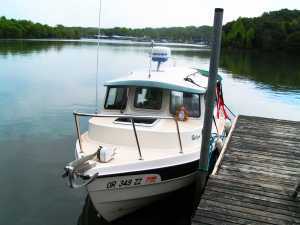 -----One of my first jobs, was to learn how to steer this boat. 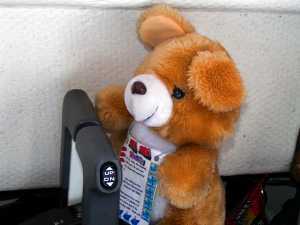 Here I am at the steering wheel, but it's a little hard for me to see where I'm going. Those dials in front of me tell me about the motor, but nothing about my speed like those in your car. The black boxes on the top show maps and where we are located on the maps. 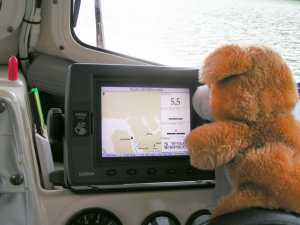 They use satellites to tell where the boat is -- something called GPS -- and it's neat, since we always know where we are -- even in a fog, or at night. 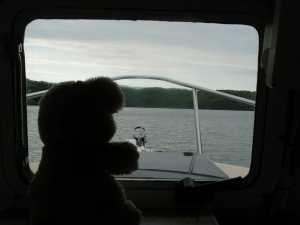 The boat steers easily and even I can do it. I'll bet you kids would love to drive it. 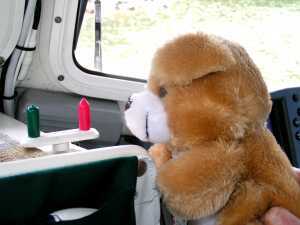 -----To make the boat go forward, you push the levers near my right hand forward. The farther you push them, the faster you go. If you pull them backwards, the boat goes backwards and, again, the farther back the levers the faster it goes backwards. 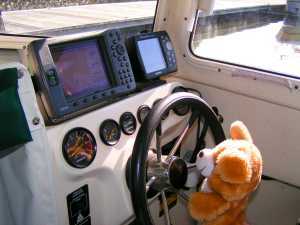 The boat has two engines, so there are two levers. Easy isn't it? 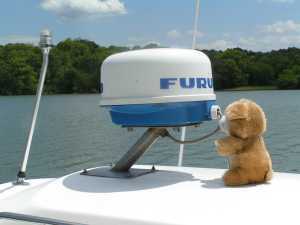 -----We talk to other boats using our marine radio. The picture below shows me chatting with another boat. That is the microphone in my right hand. You push a button on the mike to talk, and let go to listen. -----We also have a very small television and a small regular radio to watch or listen to shows in the evening. But, mostly we read about where we are going the next day or just read a good book. We are tired at the end of the day, so go to bed very early and get up at the morning's first light. I like to sit in the cockpit and listen to the birds waking up, calling to each other. I have seen Eagles, Cardinals, and many Crows. At night, sometimes I hear an Owl. 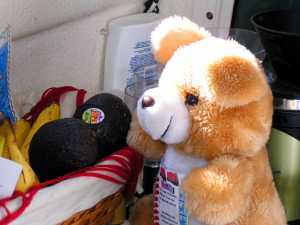 -----We eat well on board. We have fruit and vegetables many meals, and cook our food on a small stove that burns kerosene for fuel. The top lid of the stove drops over the stove. 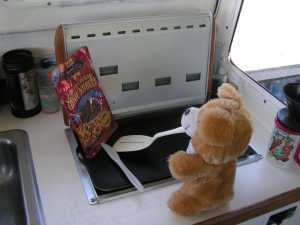 It has a fan inside and it blows hot air off the stove to keep our cabin nice and warm on the cold mornings. The last picture show the sink where I wash the dishes. 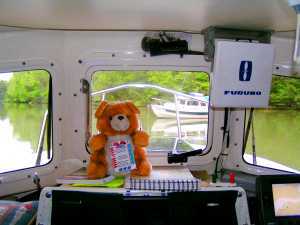 -----The pictures below show me in my new everday life as a cruising boater. I love this kind of living. Every night, the boat rocks like you are in a cradle. It's a great life, but I miss my friends in Mrs. Rolfing's class, so will be heading back home soon. 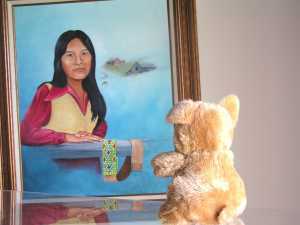 My BIG cousin at the Indian museum; I'm a birdwatcher; And see me kicked back on MY boat? 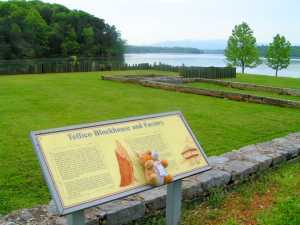 Studying some early American history at Tellico Blockhouse. 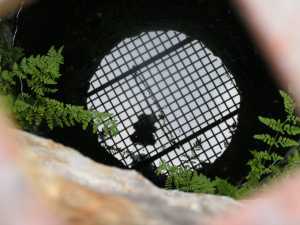 And, I'm looking down their well. Isn't my reflection in the water neat? That little gizmo can be turned. We are going upstream when the red marker is on the right. We must leave those red navigation marks in the river on our right, going upstream. If we go on the wrong side, we might hit the bottom in shallow water. On my last day on the river, we went to an Indian museum. That night I used the boat computer to write this story.